Latherford Winding Hole is a minor waterways place minor waterways place place on the waterways major waterways place village town city on the Staffordshire and Worcestershire Canal (Main Line: Autherley to Great Haywood) between Coven Heath Bridge No 69 (2 miles and 6½ furlongs to the southwest) and Hatherton Junction (Junction of the Staffordshire and Worcestershire Canal and the Hatherton Canal (under restoration)) (5½ furlongs to the northeast). The nearest place in the direction of Coven Heath Bridge No 69 is Moat House Bridge No 74; 2¼ furlongs away. 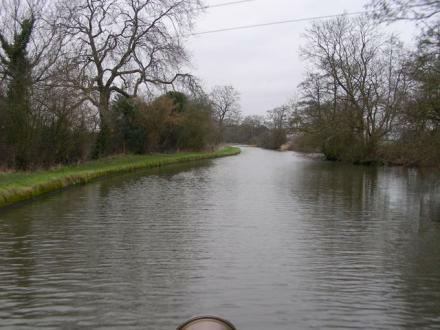 The nearest place in the direction of Hatherton Junction is Deepmore Bridge No 75; 2 furlongs away. Wolverhampton — 1436 yards to the northwest. Calibre Park, Laches Close, Four Ashes,, Wolverhampton, WV10 7DZ — 1517 yards to the west. Wolverhampton — 1191 yards to the west. Unit 5, Modular Court, Enterprise Dr, Four Ashes,, Wolverhampton, WV10 7DF — 1461 yards to the northwest. Four Ashes Industrial Estate Station Rd, Wolverhampton, WV10 7DB — 1634 yards to the northwest. The Firs straight mile, Wolverhampton, WV10 7DW — 1386 yards to the northeast. Straight Mile, Wolverhampton, WV10 7DW — 1540 yards to the northeast. Kings House, Wolverhampton, WV2 4DT — 1115 yards to the north. Wolverhampton, WV10 — 1076 yards to the north. Kings Road, Wolverhampton, WV107 — 926 yards to the north. queens lea, Wolverhampton, WV12 4JA — 1310 yards to the northeast. Wolverhampton — 1507 yards to the northwest. Four Ashes — 1540 yards to the northwest. 7 Kings Rd, Wolverhampton, WV10 7DU — 1160 yards to the north. Stable Farm, Straight Mile, Wolverhampton, WV10 7DW — 1386 yards to the northeast. 1, Brunel Court, Enterprise Drive, Four Ashes, Wolverhampton, WV107DF — 1507 yards to the northwest. unit 1, Leathermill Lane, Hartshill, CV10 ORX — 1008 yards to the southeast. Wolverhampton, WV10 7DE — 1439 yards to the northwest. Unit 13, Calibre Industrial Park, Latches Close,, Wolverhampton, WV10 7DZ — 1581 yards to the west. Units 9-11, Wolverhampton, WV10 7DE — 1460 yards to the northwest.